I hinted a few months ago that I had a few secret projects in the works. This is one of them, and I'm excited to tell you about it. As I've mentioned here a few times already, I went to a conference in October in Washington DC, of the National Coalition for Dialogue and Deliberation. An aggregation of discoveries there led me to get excited about an idea for a new project. It happened like this. Before the conference, looking up the attendees and what they do, I discovered the Group Works Deck, a set of pattern language cards people play with together to explore ways they can work together. At the pre-conference get-together, I met Galen Radtke, who gave me a copy of his card game Wamerjam. The game is designed to help people build better conversational skills. When I got home, my family tried it, and we liked it a lot. During the conference, I heard a rumor that Joan Blades, a co-founder of moveon.org and livingroomconversations.org (who was at the conference), had been part of the team that built the popular trivia game You Don't Know Jack. The rumor turned out to be true, but even if it hadn't been true, it got me thinking. So all of this got me thinking about games, gamification, and story sharing. My first reaction was (predictably) to get all holier-than-thou and say (only to myself, thank goodness) that you can't gamify story sharing because sharing stories is a game and has been since prehistoric times. I even started a blog post about how gamification is built in to story sharing and how it's silly to try to gamify a game. Then I got off my high horse and asked myself: If I think people don't share stories as much as they used to, isn't that a perfect fit for gamification? Why shouldn't I consider gamification as a way of reintroducing people to story sharing? What if I actually built a game for story sharing? What would it look like? The first thing I did, being the researcher I am, was to look at all the games people have already built that have anything to do with sharing stories. I spent days poring over the voluminous resources at boardgamegeek.com, reading about hundreds of games with "storytelling" or "stories" mentioned anywhere in their titles or genres or gameplay dynamics. In the game Rory's Story Cubes, players roll dice, then combine the story elements they get into coherent stories. In Nanofictionary, players compete to assemble the best stories from plot elements. In Once Upon a Time, players compete to change the plot of a collaboratively told story to match the cards they hold. There are lots of imaginative, and fun, games in the genre of fictional storytelling. But I am primarily interested in helping people share stories about things that have actually happened to them, because I think we have forgotten how much fun that can be. I did find several games where people recall and tell real stories, but I didn't like them very much, for a few reasons. First, they're too simple. Most of the prompts for telling stories are factual and superficial: people, places, things. Also, the game is the story prompts. For example, the game Rememory consists of over 200 prompts like (the ones I can see on the advertisement) "the tree," "summer," and "joy." I found several other games that were made up of similar lists of things you might tell stories about. Lists don't seem much like games to me, even if you add a few gameplay rules. I also found quite a few games in what I'll call the stories-as-lies genre, where players compete to trick each other into believing things about themselves, sometimes by telling stories. These are also simple. For example, in the game Are You For Real? players gain points by getting people to believe stories that never happened. In The Secrets Game, players gain points by guessing whether other people are telling the truth. While it's true that people evaluate the truth values of other people's stories, that's only one aspect of what stories are for. I'd rather support every reason people share stories, not just one of them. Second, the non-fiction story games I've looked at make story sharing seem like a chore, the kind of thing parents make children do "for their own good." For example, the description of a game called The Ungame at boardgamegeek.com includes the sentence, "As you share thoughts, ideas and feelings, you will develop a deeper understanding of others and of yourself." That's pretty much what I would like to help people do in my game, but I wouldn't want my game to say that (or feel like that). I would want people to play the game because it's fun, not because it's good for them. One of the most shocking moments during my exploration of story games was when I found a photograph of a similar "sharing" game being roasted on a barbecue. The caption said something about this being the only use somebody could come up with for the game. I don't remember what game it was; but it was a very useful image of the kind of game I don't want to create. But the worst problem with non-fiction story sharing games is that none of them make sense in light of the way people actually share stories. The rules of the game LifeStories are described on boardgamegeek.com as "Basically, roll the dice, move, draw a card, and share something about your life as directed on the card." But story sharing doesn't work that way. People don't think of one story to tell, tell it, then move on to another topic. In actual conversation, stories flow in linked chains through reaction and reminding. One of my sisters tried the game Rememory, and she said she found it frustrating because every time she heard a story she thought of several she wanted to tell in response, but the game wouldn't let her. Any game in which people tell stories about themselves has to work with the dynamics of natural story sharing; but most of the games I saw in this genre worked against it. Storytellers negotiate for the floor by submitting a story abstract to the group. Audience members accept, reject, or modify proposed stories during the story abstract. Storytellers embed in their story evaluation statements that prove the story is worth listening to, and communicate their intent in telling it. Audience members redirect stories as they are being told by providing feedback, questions, and corrections. Storytellers negotiate the end of their story (and the return to the normal conversational rhythm) in the story's coda. Audience members participate in fitting the story into the conversation by asking questions about it and discussing aspects of it. Audience members respond to stories with related stories, building chains of connected stories in collaborative exploration of a topic. This all happens without anyone being fully aware that it is happening. You can watch people do all of these things in any casual conversation anywhere in the world, and probably could watch the same thing happen thousands of years ago. Based on this, I realized that what should matter most in the game are connections and explorations, because that's what people do when they share stories. They connect their experiences together, and they explore what their experiences mean. What struck me most in all of this reading was the fact that every good game presents a challenge to its players. People vary in whether they prefer to compete or cooperate, but everyone likes to achieve a sense of accomplishment and mastery. If a game is too easy or too hard, it's not fun. It has to be just hard enough. So I thought about what skills I would like people to feel mastery over. I'm not interested in storytelling skills, and besides, there are lots of good games about those already. I'm interested in helping people master the art of narrative conversation, of being able to work (and play) together with other people to create webs of exploration and connection by sharing stories in interesting ways. This is the challenge I want to present to players; this is the skill I want to help people develop. Peer with me, if you will, into the mists of the past, to a time when people had superpowers we can only dream about. They could read maps. They could write words on paper with things called pencils and pens. They could fix their own cars. But let us travel even further back, into an age of powers beyond imagination. Verily I say unto you: there was a time when ordinary people could sit in the dim light of hearth and candle for hours, weaving dense, complex, fascinating webs of stories. These masters of the tale didn't "stream" stories; they remembered, created, and shared them. I know it's hard to believe, but small groups of people could once entertain, instruct, and enlighten themselves without the aid of a single electronic device. It is time to bring back what has been lost. Can you rise to the challenge, revive the ancient art of story sharing, and become a master of the tale? If you yearn for the days of legend and lore; if you crave creative anachronism; if you thirst for magical powers of wisdom and wit; your journey awaits. Open the doors to time travel. Welcome to Narratopia. It's over the top, I know. I'll have to hide this particular write-up in a nook of the web site to avoid sounding very strange. But that's my ultimate goal. Now I'll tell you how the game works, and you can think about whether it works. I did decide to include the possibility of telling fictional stories in the game. I didn't mean to do this at first, but on one of our first play-throughs of the game, my son fluidly switched to a fictional story in mid-game. It didn't ruin anything, and the flexibility to walk in and out of reality made the game more fun. So I loosened up and opened the door to fiction, either for the whole game or for parts of it, as the players choose and agree. It's more important that people enjoy the exchange than that they keep strictly to what actually happened. Besides, people used to drift into telling tall tales and folk tales during everyday conversation; so that's nothing new. Back to the gameplay. After the first story is told, its teller gives it a name, and somebody writes the name on a sticky note and sticks it on the table. Then the question cards come in. There are two sets of 24 question cards in the game. Each player keeps three question cards in their hand at all times. These cards are questions people might naturally ask about stories other people tell. I've drawn them from my experiences asking people questions about their own stories, and from my observations and readings about how people respond to stories in conversation. Each question card has at least one blank, which players fill in (as they read out the question) with relevant words. Details - Can you tell us more about _____? Needs - What do you think _____ needed? Response - What do you think _____ would say about _____? In Charge - Who was responsible for _____? The question cards have three levels of difficulty (easy, medium, and hard). The easiest questions require little thought, while the hardest are subtle (for both storyteller and audience). For example, the "details" card is easy to think about, while the "in charge" card is more difficult to ask and answer. After each story is told, the other players ask up to two questions each, using the cards in their hands. The storyteller answers the questions as they come up. When all of the chosen questions have been asked and answered, the storyteller chooses their favorite question, the one they were most glad to have been asked. They hand that card to the questioner, who keeps it (as part of their score) until the end of the game. Then it's the next person's turn. For each story told after the first turn, players must use a link card to connect it to any previously told story. The link cards help people build chains of connected stories (the way people normally do in conversation). As with the question cards, there are two sets of 24 link cards in the game. Everyone gets three link cards at the start of the game and replenishes their set anytime they use one. As with the question cards, these are rated by difficulty ("reminding" is easy, "behavior" is hard). The difficulty ratings translate to point values, and they also make it easy to adapt the game for beginners or more advanced players. To end the game, each player chooses their favorite links, choosing only from those links that followed their own stories. Whoever placed those links gets the points marked on them. Finally, whoever gets the most points (questions plus links) wins the game. The game can also be played cooperatively, with the whole group guessing together which question or link each storyteller likes best, and the whole group gaining points by guessing correctly. In that case the whole group meets the challenge of proving their skills in conversational narrative. Multiple groups can compete for the highest collaborative scores. You could say that Narratopia is a no-pressure party game, since judgment is based on preference and not adherence to fixed criteria. But if you understand how stories work in conversation, and if you listen attentively while stories are being told, you will be able to guess which questions storytellers will most want to answer and which linked stories they will most appreciate. I've tried a lot of different point schemes, and other motivational elements, in my testing so far. I think this one works best because it rewards mastery of the art of conversational narrative. But I need more testing to be sure. If you're curious about how I'm producing the game, by the way, I'm using the print-on-demand service thegamecrafter.com. The Game Crafter is not the cheapest service of its kind, but I like the quality of their products and service. The game will eventually sell for US$20. I will get very little of that, because production costs are high for print-on-demand (nearly $14 of the $20 is production cost). If I am wrong and the game becomes very popular, I might be able to produce it in bulk for a better price and/or profit. But right now I'm not thinking that far ahead. I'm just thinking of the whole thing as yet another who-knows-what-will-happen project that I've done because it wanted to be done. Now I'll go back to the elements of natural story sharing I mentioned previously and try to prove to you (and to myself) how Narratopia supports all of them. 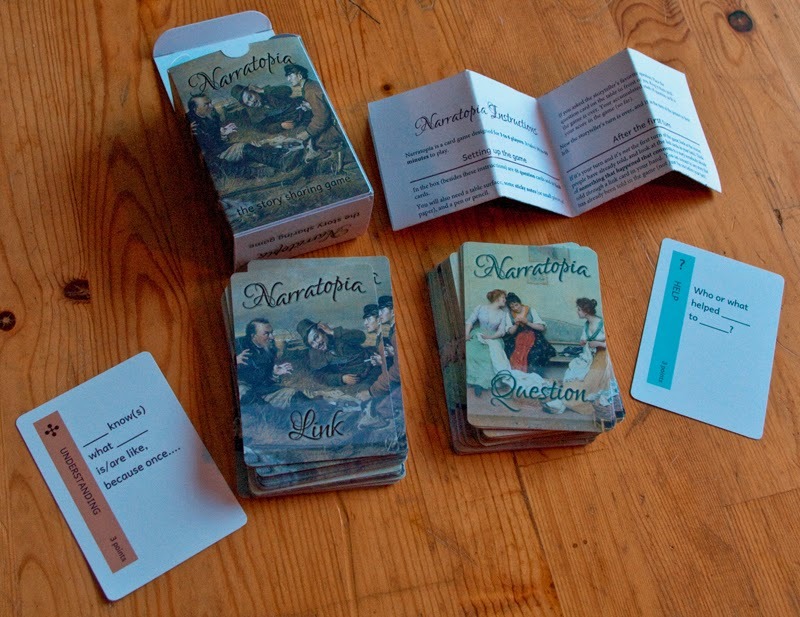 In Narratopia, players submit story abstracts by placing link cards on the table. Players don't stop each other from placing link cards (unless the fit is very bad or obnoxious), but badly matched link cards aren't chosen at the end of the game. Looking over your link cards and deciding which to use (and how to fill in the blanks on the card) is similar to deciding what story you will tell in a group and how you will introduce it. All of this happens naturally in the game, without explicit connection to the cards. (The game doesn't limit or shape the conversation while a story is being told.) However, players who are paying attention can use elements of evaluation and negotiation to guess which questions (of those available to them) the storyteller might find most interesting to answer. The phase of each turn where players ask questions about the story and the storyteller answers them (and some other conversation might ensue) works with the natural dynamic of story codas. People are guided to make sense of how the story relates to the other stories and to the topic at hand. Using link cards to think of new stories to tell prompts people to participate in this natural process. Because choosing each storyteller's favorite link gains points, people work to create connections others will enjoy. The result is that the whole group will explore topics together. The question that remains in my mind at this point is: How well do each of these assertions about what Narratopia is designed to do play out in practice? Does it really support natural story sharing, or have I not yet hit on the best means of support through gameplay? At this point those who are still reading this will be wondering about my intended audience. Do I want people to use this game in story projects? It certainly could be a useful means of story collection about a topic, and I can see it being used in that way. But that application is low on my list of ambitions for the game. The thing I want most for this game is for ordinary people to play it simply because it's fun. I may be far from realizing that goal, but it's a little hard to tell at this point. We have played the game in my family several times, and we love it. I thought we three couldn't possibly get to know each other any better, but it seems like every time we play the game we discover all kinds of new things about each other. We also dive into some complex discussions about whatever topics we happen to fall into exploring, like mistakes or miscommunications or the vagaries of chance. And so on. I can also envision expansion packs with questions designed for particular contexts (health care, education, development) or even for particular communities or organizations. But exploring all of that will come later as the game matures. Right now I am more concerned with creating a firm foundation for later work. Aside from one useful trial with relatives over Christmas, I haven't yet play tested the game outside my immediate family. This is where I need your help. I have bought ten copies of the game for play testing. Three are spoken for already, but (as of this writing) seven are still available. So here's the deal. If you promise to play the game, tell me what happened, and answer a few of my burning questions, I will send you a free (physical) copy of the game as it stands right now. If you are interested, send me an email: cfkurtz at cfkurtz dot com. When I'm out of games I'll post an update here. EDIT (April 4): I'm out of games. Thanks to all who play tested the game! I would like to get at least ten play-test results so I can tweak the game further before I start to actually sell it. If the first play-test run goes well, I might go straight to sales, but I might need another test run afterward. Some people test their games a hundred times before they sell them; some test far less. I usually find that products tell me when they are done, and Narratopia will probably do the same. If you aren't interested in play testing the game, your opinion of the game instructions would also be useful to me. I can send those to you via email (only please don't redistribute them; this is one of my rare projects that is not open source). I would love it if you could poke some holes in my ideas and trip me up where I feel secure. I have also created a web site for the game, narratopia.com, which I'd love to get feedback on. (There is a gameplay video there as well as lots of other information.) Please send feedback via email or in the comments here. I am eager to find out what you think! Cynthia, this is so funny. We must have been drinking the same well-water or something. I have been messing around with a board game for about the past year. I have been doing many of the same things you have - building prototypes, researching on boardgamegeek and other places, etc. It's pretty amazing. So, here's an idea: if you still have some games that are unclaimed, we can exchange game copies. Mine has nothing to do with stories (really). I'd be happy to play the game and give feedback! What a coincidence! Although statistically speaking, the probability that any two people are thinking about self-publishing something at the same time is getting higher and higher - gotta love the internet ;) I will reply in email, but yes let's exchange games and help / learn from each other. Thanks for writing! What an awesome article Cynthia! Thank you so much for writing it. It is a breath of fresh air, particularly these days when so much emphasis in storytelling is on "Let me tell you a story" with the emphasis being on telling as in 'pushing'. Story sharing is the heart of storytelling as you point out so well. I love it. Keep writing such great material. Thanks for the comment, Karen! I'm glad to provide balance, though sometimes it feels like I'm a lone voice in the wilderness (but don't we all feel that way sometimes). I hope Narratopia succeeds in making its way into the world, and I'm grateful for any and all feedback that can make it better. So thanks again! My first thought when seeing this was, can this be used with children? Most do not get either vocabulary building or creative expression opportunities. For adults and children, could this be used in library activity programs for building vocabularies and developing social connections? Teens? My particular passion is promoting healthy early brain development. Beginning at birth, stories provide the social, emotional and language experiences babies and children need. I'm interested in knowing if you see your games used in this manner. Sandy, thanks so much for the thoughtful question. I have been thinking mostly of adults and older children so far. Having my 11-year-old son involved in the game's development has helped me to think about what works for his age and older. Another part of this is that TheGameCrafter,com, the site I'm using to print the game on demand, requires that its games be labeled "12 and up" due to US restrictions about lead testing in products for young children. So I've been thinking about mainly the 12-and-up crowd. I definitely think a game like Narratopia could help younger kids learn social skills like careful listening, respectful questioning, and perspective taking. Some of the concepts and words in the game as I have it now might be difficult for kids 9 and younger. I've seen kids as young as six able to handle complex game structures, but thinking of ways to ask people how they feel or what they need is difficult at that age, even if you're just filling in a blank. I would want to rewrite the cards to be easier to understand, and maybe add some pictures, even though the basic functions of the exchange would stay intact. I'm not sure about whether the game could be useful for vocabulary building. Learning the situated meanings of words on the cards, like "perspective" and "clarify," could be helpful, I guess. But even in the older-kids-and-adults version I've tried to keep the vocabulary simple so the questions don't get too much attention and the story exchange takes center stage. I guess maybe *directed* vocabulary building, where the vocabulary is about the ways in which we communicate and negotiate truth, would be something worth thinking about for younger kids. Lots to think about! Thanks so much for posting such a thoughtful and helpful comment. Right, I'm supposed to click "Reply"! I used to, but lately I've been forgetting. Oops. No way to fix it. I love your "Little Steps for New Parents" book! I can see how the mix of advice, information, and a place to reflect would be very helpful, and in non-intimidating tidbits. I remember being tossed this way and that when my son was an infant. The only thing I was sure of was that I didn't know what I was doing! Thanks so much for your offer of talking. I'd like to take you up on it and will send you an email. it has been tremendously emotional finding your article and reading it all at once. At least once in his/her life, who hasn't played to a roleplay like Dungeons & Dragons or read fantasy books? These stuff, anyway have either little or nothing to do with your card game, especially for someone like me who works with communication, storytelling up to the use of stories in the healthcare field by narrative based medicine. At the moment I would be interested in using the game but not so sure about finding someone due to the language barriers (in Italy we're not so good). What about planning to translate it in the next future? Our country could be a really good market because of the different uses you can make of it. In the mean time, my most sincere compliments for what you've done so far! Yes I am very interested in game translations. If you (or if anyone) would like to collaborate on this, I would love to work with you (send an email to cfkurtz at cfkurtz dot com). I wouldn't start any translations yet, because I will be making some changes based on play testing, but when it's time I don't think it would take a bilingual speaker long to translate the texts on the cards and instructions. Hi Cheryl, very powerful process. I would love a set. I get together once or twice a month to play card games with extended family, storytellers all. Thanks for the comment, Nadia. Cheryl is an interesting choice. I wonder if it represents a new phase in my life. In my twenties and thirties people always misremembered my name as Sylvia, but about ten years ago it transitioned to Cathy and has been there ever since. Cheryl may mark another transition to a new perception. I can't say I've enjoyed the Cathy years -- nothing against Cathies, but I just don't feel like one. I could be a Cheryl with satisfaction (though I might need to curl my hair, or at least brush it more often). In fact, a new era of Cheryl may be just what I need. Thank you. Please send me an email, to cfkurtz at cfkurtz dot com, with your (real) address and I'll send you my last play-test copy of the game. (!) I would love it if your extended family tries the game! Thanks again! I was wondering if you still have sets available... I teach 8th grade English and immediately see how Narratopia could be used in my classroom to build community, engage students in literature circles, and act as a pre-writing exercise. Let me know! I'd love to use them with my students. Billie, thanks for your comment! Sadly the last play-test game has been taken (sorry, I hadn't updated the post in time). Even though I'm out of game copies to give out, I am still very much interested in any reactions you might have about the game's general idea, artwork, and gameplay (which you can read about here and on the game's web site, narratopia.com). All the feedback I get now will help me make the game better! Cyntia, I'd be happy to do Russian translation when the time is right and can probably arrange for a Dutch one. I also see a potential for a kids version of the game as you have discussed above with Sandy and have enough of young kids around for a test run if necessary. Hello Lilia! That would be amazing. I am definitely interested in as many translations as possible, in time. I have to think carefully about a younger-kids game. Usually the method is to use drawings or photographs instead of words for younger kids, but I'm not sure how to picture questions about stories and links between stories. It might be necessary just to use smaller, simpler words instead of pictures. Definitely worth thinking about as soon as the "main" game has stabilized (right now it is undergoing changes as a result of testing). I will definitely remember and look you up when the game has matured to where it can start creating new versions! Thanks again.